This is an index to 9,000 wills filed and probated in Alabama between 1808 and 1870. The index itself is a model of simplicity, giving, in alphabetical order, the name of the testator, the county of probate, the identity of the record source (usually a will book), the date of the book, and the page number.This volume is also available on our Family Archive CD 7527. 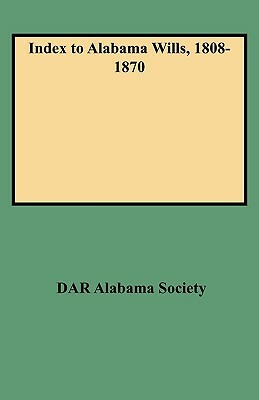 Description: 180 indexed pages of Alabama wills from 1808 to 1870 with the following information, Name, County will is located, book and page containing record and date.